Income reports are all the rage right now. Since WPscoop does not generate any income yet I decided to call this post a growth report instead. It tells the story of how I built a WordPress resource site over the past 1.5 years with all its successes and failures. Mixed in are several of the lessons I have learned along the way. I bought this site in early 2010 in an auction on the popular website marketplace Flippa. At this point WPscoop was a Reddit clone where users could submit, share and upvote WordPress related content. The site was nothing big but it had a small following of regular users and received a few thousand visitors per month. I don’t remember the exact details but I probably had big plans for the site back then. And as happens so often I never found any time to carry them out, since I was completely focused on my WordPress products (which were earning me money). The site was left abandoned and turned into a spam-infested hell rather quickly, which caused it to lose all of its traffic and rankings. In 2013 I finally cleaned up the mess: I razed down everything and started WPscoop again as a simple blog for WordPress tutorials written by myself. While doing that gave me some valuable experience and helped me improve my writing skills I quickly realized that regular blogging was nothing I wanted to focus on. I preferred building and improving my WordPress products. I quickly lost interest in writing new posts and after less than a dozen articles this site was abandoned and forgotten once again. That changed when at the beginning of 2014 I had a unique idea: I wanted to turn WPscoop into a resource site focusing on detailed comparisons of premium WordPress plugins as well as user reviews for those. Something I felt did not exist yet, at least not in the form I envisioned. Since premium plugins are not listed in the WP.org plugin directory finding reviews by actual users was hard and in my opinion comparison posts or reviews on popular WordPress blogs were often lacking in quality and depth since they are usually created by freelance writers. Basically I set out to create a comparison platform for people to turn to when they had to choose a premium WordPress plugin. My comparisons – ordered by categories – should help them research plugins that match their specific budget and feature requirements. The user reviews should add feedback by actual users of the plugins on how well they work. This was where my knowledge with building WordPress plugins came in handy. Since I wanted my comparisons to be more than the typical list post of “10 best plugins to do x” I created a custom comparison script. After feeding my new script with lots of data (products, features and prices mainly) about commercial WP plugins in a niche it generates the comparison page, which includes a cool plugin search form: Visitors can filter the listed plugins according to their own requirements and budget to find the best choices. Voila! I had a unique feature for WPscoop, setting it apart from all other plugin review sites. While the script handles a lot of the work creating all the different comparisons and collecting the data still took quite some time. I started off with the very first comparison of WordPress form plugins in spring of 2014 and then added more and more categories over time. As of now there are 10 different categories listed on WPscoop containing more than 70 commercial plugins, including for example the most popular eCommerce plugins and membership plugins. My custom comparison script was updated several times during the past year as well in order to improve the resulting comparisons further: I added a way for plugin developers to correct and verify the data for their plugins themselves, overhauled the design of the site several times and most recently added a detailed statistics page with information on average WordPress plugin prices. In November 2014 I finally launched the user reviews feature along with a separate reviews page (like this one for WooCommerce) for each of the plugins compared on WPscoop. The goal was to collect feedback from actual plugin users for all the premium plugins. The reviews are meant to provide more help with decisions in addition to the hard facts (on prices and features) that were already part of my comparisons. At first I had planned to again build a custom script for the user reviews feature but I quickly realized that I did not have the time necessary to accomplish that, especially with all the bells and whistles I envisioned it should have. Instead I settled for the already available “Comment Rating Field Pro Plugin” by WP Cube, which was very easy to implement and did a good job overall. Or rather: How I tried to promote WPscoop. The honest truth is that most of the things I tried failed or did not come close to the effect I was hoping for. My main attempt at promotion was via content marketing and outreach. I created several high quality tutorials (at least I like to think so) as well as opinionated posts with the hope to get them shared and covered on WordPress news sites. Among these posts were for example my tutorial on how to promote a new WordPress plugin, my detailed statistics on premium plugin pricing as well as several announcement posts regarding features added to WPscoop – like this one where I shared my ideas and goals for the site. While all of those articles were well received by the general public (e.g. in social media) and often got upvoted highly on ManageWP.org their reach always stayed below my expectations. Some posts got mentioned in smaller blogs but no matter what I tried all the larger WordPress news sites ignored them entirely. When the user reviews feature for premium plugins launched I hoped again that this would create some buzz in the WordPress community, since I felt it was something both not done before and useful. How wrong I was. Again basically no one cared. I shared the news with several of the mayor WordPress news sites but received no replies from any of them. Now don’t get me wrong here. I am not naive enough to think that everything I write or do deserves to be featured on lots of websites. I also respect the right of our news writers to choose what they deem worthy to write about. But it can simply get frustrating if a project you hold dearly and believe would make a good story gets turned down again and again. There are not many WordPress-specific news sites to reach out to in the first place. Had I written on broader business or online marketing topics I might have had an easier time. I do not have the name, popularity or connections to pull this off properly. From following WordPress news closely I am convinced that having a familiar name or having personal connections from taking part in the North American WordCamp circuit can help immensely. I do also have to admit that I did not put in the time necessary. Promoting content takes a certain level of endurance and since I was running a WordPress business on the side I might have fallen short here. Besides those failed attempts at content marketing another source of promotion for WPscoop were my free WordPress plugins, which are now all listed on this site. Some of them existed before the relaunch but I decided to move them here so that all are in one place. The plugins receive a regular stream of visitors from WordPress.org. Furthermore I also found that it was much easier to get featured on other WordPress blogs and news sites with free plugins (in particular my ImageInject has become quite popular) than it was with the content I wrote. Of course that could however also simply mean that I am better at creating plugins than I am at writing articles. What I wrote above might sound like a long list of failures but luckily in reality the numbers do not look bad at all. 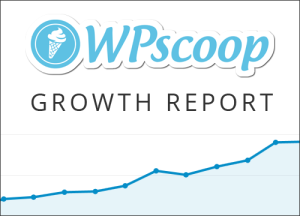 Even though my marketing ploys did not work out to the full extend I had hoped for WPscoop still enjoyed slow and steady growth over the past 1.5 years. Basically for WPscoop the mantra “Build it, and they will come” turned out to be true. The site does now receive around 17,000 visitors per month. This number might not sound impressive to everybody but for a site that is both a side project as well as focused on a specific niche within WordPress I consider it a success. 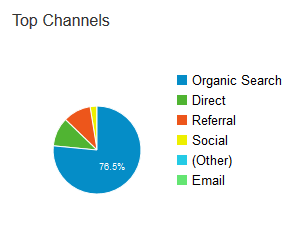 Interesting to note is that most of the traffic is organic search traffic. More than 70% of all visitors get here by finding one of the plugin comparisons on Google. While news sites were reluctant to cover Wpscoop the big G seems to really have taken a liking to it. How did that happen? I am far from a SEO expert but I guess the clear and narrow focus of the site played a big role in getting it ranked for many different long tail keywords in search engines. The way I structured the content on WPscoop might have been another contributing factor. I used pages instead of posts for all content that I wanted to rank, each of them with a clear focus and a hierarchical structure (parent and subpages). In my opinion pages are the way to go for evergreen content that is intended to stay updated, like my comparison articles are. Posts on the other hand are better suited for news items, personal thoughts, commentary or anything else that loses relevance over time. I am still surprised that so many other big WordPress sites use posts for every kind of content, even though they will quickly disappear from the frontpage – making them harder to locate for visitors and search engines alike. Anyways, the most important takeaway from those statistics might be that building a WordPress site in a small niche is much easier than a general all-topic WP blog and does not even require any huge marketing successes. This is why I would advise anyone who is thinking about starting a new blog about WordPress to go the same way and find such a niche topic for themselves. As the WordPress community grows and attracts a mixed audience of developers, designers, businessmen and others it gets harder to get traction with a general WP blog trying to attract everybody. I see the user reviews on WPscoop as one of the most valuable things on the site for helping visitors find the plugins that are right for them. But as I already expected before launching the feature getting people to submit reviews is extremely hard. Over the past 6 months visitors have left a grand total of 93 reviews. While many of the popular premium plugins already have 5+ reviews many smaller ones are still sitting at zero. This is where my failed outreach attempts come back to bite me. The search traffic that finds WPscoop is looking for solutions and simply in no position to write reviews. To get more of those I would have to attract more people on the user side to visit WPscoop, for example by building a community around the site. The most important challenge for WPscoop will certainly be to grow the site further. Traffic growth has already stagnated over the last 2 to 3 months, where I did not work on the site at all. The best course of action here would probably be to hire a writer / editor to create new plugin comparisons and update the existing ones, since I do not have enough time for it myself. The problem with that is he/she would need to be able to use my comparison script, which unfortunately is a mess without any real user interface. Another problem is that the site earns no money yet to finance hiring said writer. This brings me to the second challenge: Monetization. Which is something I have not given too much thought yet as I do not depend on making an income from WPscoop, but to drive the project further it will become a necessity. I did already look into affiliate programs for the various plugins compared here a little and gave some of them a try. After doing so I am fairly certain this is not the way to go: Only a few of the premium WordPress plugins listed on WPscoop do have an affiliate program in the first place. Of those many don’t seem very reliable and could be terminated at any moment like we have seen happen in the past. Alternatives will be sponsorships, banner sales or some form of pro listings / upgrades for the compared plugins. All of them will have their own pros and cons. Exploring those will be topic for another post, maybe in a year from now when I can look back at how growing WPscoop further and monetizing it have worked out. I envision it might turn out to be another odyssey of trial and errors. But as long as the end result is positive again who am I to complain? Are you sure? I did some research, and the majority of the premium WordPress plugins DO have an affiliate program. Maybe you couldn’t find the affiliate section? I noticed that you already inserted some affiliate links. Can you update us how it went in terms of monetization? May be the SEO hit at 2mths. It can be spontabeous as well. Basically, I Enjoyed reading your story of building a WordPress related blog with all the challenges.I think the demand for detailed unbiased plugins (and themes) comparisons is really high in the WordPress community, hence WPScoop success is almost guaranteed! Thanks a lot for sharing this valuable content with us. I visited this website for a long time ago and it was actually a place for spam news. But now I see everything is changed. This is a really good news. Congratulations for the success and hope everything will go well in the future. It seems now you are getting 75K monthly pageviews. Hope you get more visitors as the reviews you write are pretty good! 17,000+ visitors is not surprising, due to the high quality content you continually create. Hi, why don’t you advertise on wpscoop.com? I will try to sell advertising on WPscoop later on. Wow Thomas, great work. In the tough WordPress niche, you are doing a great job. You are literally killing it out with your in-depth comparison posts. I think the demand for detailed unbiased plugins (and themes) comparisons is really high in the WordPress community, hence WPScoop success is almost guaranteed! Enjoyed reading your story of building a WordPress related blog with all the challenges. Also, I like your advice of focusing on niche topic within WordPress for beginners. All the best with future challenges and look forward reading more.